Cherokee Runway scrub tops were designed as a means of enabling nurses to display their impeccable fashion sense while on the job. 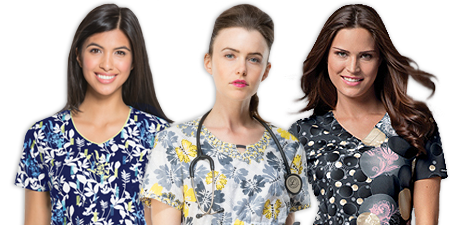 The collection boasts chic, printed designs and slimming, feminine cuts that are sure to transform you into the style icon you always wished you could be.You'll notice that this line of nursing uniforms is made up of bold colors, lots of floral designs, modern geometrics, and charming motifs. What, however, is the inspiration for this unique line? Where are these style ideas culled from? Each design is hot off the latest runways in London, Milan, New York, and Paris, and the brainchild of only the creme de la creme of fashion designers. So, when you need to infuse a little fashion into your medical scrubs ensemble, it's time to hit the runway; the Cherokee Runway that is! Between the flattering fit and fashionable look, Runway scrubs by Cherokee are the nurse’s pathway to looking glam all day long. Ooh la la!